Spectrum Slim-G Airband 118-137MHz 3/4 wave RX & TX Antenna. Made in Dorset UK. Antenna is intended for RX only. antenna pose very low wind profile. it is 1/2 antenna with tuning sleeve. antenna is using Alumunium holder type 43. civil band 118-137Mhz. military band 230-380Mhz. great for scanning 27-400mhz. Amateur use 144-146mhz. it is half wave sleeve antenna. antenna is using Alumunium holder type 43. antenna does not require the rf ´´air´´ choke as it is already equiped. antenna type COD144-146/FG43. Marine Products. DC Ground end fed 1/2 wave radiator. Plugs prefitted. Ski Snowboard Gear. Sealed tin-plated copper wire coil. Stainless Steel Mast. ABS Plastic & Stainless Steel Bracket. If no one is present, a card will be left advising of the nearest pos office or parcel collection point where the item can be collected. The ‘Skyscan’ is a great all-round scanning antenna, which should enhance the reception capability of any radio scanner. for more scanner aerials. Mounting 90 mm magnet. We will always help you to have a 100% positive happy buying experience. Operates on VHF International Frequencies. Pool Lights. Marine Products. Mounting: Nylon rachet mount with 1" x 14 TPI. Cable: 4.9m (15') White RG58A/U stranded tinned copper 95% Shield. Includes Stainless Steel hardware for mounting. The item will send within. BNC connector. Specifications & Features. Slim-G Aerial for Air-band operation, receive or transmit. The aerial was originally developed as a J pole with a 1/4 wave section as one side and a 3/4 wave section the other side. The two sections are joined at the bottom and the feeder is attached a little way up from the bottom and with the braid side of the coax to the short arm. 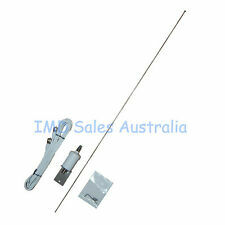 New listingMetz VHF antenna (aerial) and 15m RG8X cable kit - Special package deal! Ideal for VHF radio or AIS. And by many, many thousands of individuals – it’s been in continuous manufacture since 1977. This is a very high quality stainless steel marine antenna (aerial). Waterproof Rubber Duck Dipole Flexible Marine FM AM Radio Antenna for Boat Marine Yacht ATV UTV RV Tractor. 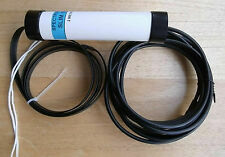 New listingMetz VHF antenna (aerial) and 20m RG8X cable kit - Special package deal! Radio NOT INCLUDED with this item. More information about delay see at. Typical reception current: 30 mA. 1 Finished Aviation Band Receiver. Antenna: 50Ω, unbalanced. 1 Rod antenna. Working pattern: AM. Am 01.09.18 hat der Verkäufer die folgenden Angaben hinzugefügt. AV Transmitter and Receiver. FM Transmitter. Audio Accessory. Nobsound®——Dou​k Audio. DAC / Audio Decoder. 1 Finished Aviation Band Receiver. Bluetooth Audio Devices. Choseal Audio Cable. GPA 108-136. Civil Air band Ground Plane Antenna. Type : 1/4 wave Ground Plane. Bandwidth at V.S.W.R. 2:1 : 12 MHz at 108 MHz. Wind Load / Resistance : 35 N at 150 Km/h / 150 Km/h. Connection : UHF Female. Radio NOT INCLUDED with this item. COMPLETE IN BLACK WITH A PL259 PLUG. CONNECTOR TYPE: PL259. FREQUENCY RANGE: 144 - 158 mhz (marine 145mhz covered). MARINE MAG ANTENNA - MAX PERFORMANCE. MAG BASE SIZE: 50mm. The magnetic base has a rubberised coating to prevent scratching, the whip can be unscrewed away from the base and has an allen key joint to remove the whip from its holder. Ski Snowboard Gear. Antenna can be detached when not in use. Marine Products. Heavy duty lift & lay base assembly. Warranties do not cover installation or third party costs. If no one is present, a card will be left advising of the nearest pos office or parcel collection point where the item can be collected. A Professional CAE TA-29 Wideband Monopole Receiving Antenna. Wideband option 1Mhz-3Ghz. --If I know an item is faulty, it will be listed as such. This is the Marine VHF Band dipole antenna, tuned to the centre of the Marine Band (156 - 162MHz) to give maximum signal coverage for your scanning receiver. Very high quality indeed. Complete with mounting bracket, ready to go. Lowest SWR at 125.0MHz designed for AirBand VHF 118.0MHz - 136.0MHz Max PWR 10 Watts. 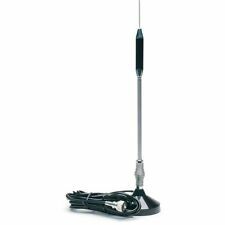 Metz marine VHF antenna (aerial) for boats: Lifetime warranty. Probably the best VHF antenna (aerial) made. Your VHF Radio is only as good as the antenna to which it’s connected! 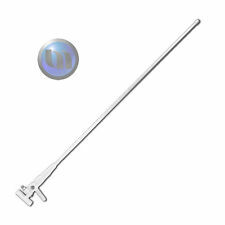 This is a very high quality stainless steel marine antenna (aerial). It is ideal for masthead mounting due to low weight, stainless construction and UV resistance. A Boxed YUPITERU Airband Receiver VT-125 II. You are looking at one Yupiteru Airband Receiver / scanner. Model/: VT-125 II. These are very difficult to find, even a second hand one is hard to find. So don’t miss out on this. Active Nomad Scanner Aerial (PP3 or ext DC). 25-500MHz. Made in Dorset UK. The Active Nomad Scanner Aerial (DC) can be used portable, suspended from a gutter or a tree, or indoors supported from a cup hook in a loft or from a ceiling. The MARINE-450 is a very robust, complete weather and water proof marine antenna. Its is of a high quality fibreglass and can handle all vibrations and wind speeds without problem. Connection: PL259. GPA 66-108. GPA 40-70: 3.7MHz @ SWR 2. Type: 1/4 wave ground plane. Type : 1/4 wave Ground Plane. Bandwidth at V.S.W.R. 2:1 : 6.5 MHz at 66 MHz. Wind Load / Resistance : 54 N at 150 Km/h / 150 Km/h. Covering both GSM/NMT-900, DCS-1800/PCN (GSM 900/1800), PCS-1900 and UMTS. Provided with the sturdy “LW” mast mount – a lightweight, multipurpose, epoxy-coated mounting bracket made of non-corrosive aluminium. Impedance: 50 Ohms. Max power: 100 Watts. Weight: 500g. Length: 122cm. Gain: 4.0dBi. Waterproof Marine Radio Antenna Rubber Duck Dipole Flexible Mast FM AM Antenna for Boat Car ATV UTV RZR SPA - Black. Car Marine Rubber Radio FM AM Antenna. Marine Rubber Radio Antenna. Great reception for AM/FM. Heavy-duty, low profile, 1in. High mount with standard QuickConnect connector. PART NUMBER: 818-QC-4710. Part Number 818-QC-4710. Matching for VHF Marine Band VSWR 1:1.5 at CH16 (156.800MHz). FIVE N type Plug Male Connector Clamp Type COAX RG213 / 214 / LMR 400. The threaded coupling ensures proper mating in applications where shock and. Insulation Resistance - ≥5000 mΩ. Centre Pin - brass, gold plated. Frequency 144 MHz to 158 MHz - UP TO 174 MHZ. The antenna whip is self-coloured - COVERING THE MARINE BAND at 145 - 158 MHZ. AND UP TO 174 mhz. 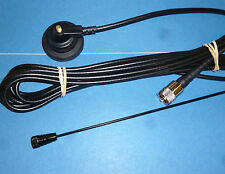 MARINE ANTENNA COMPLETE IN BLACK WITH A PL259 PLUG. THIS IS A BODY MOUNT ANTENNA MANUFACTURER TO A HIGH QUALITY. 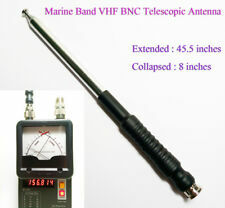 Designed for Marine Band Handy Transceiver, Matching for 156MHz - 163MHz Max PWR 10 watts. Great reception for AM/FM Radio. Marine Rubber Radio Antenna. Weight 200g, Cable Length52", Antenna Length: 40cm. Weight 200g, Cable Length52", Antenna Length: 40cmFeatures Waterproof and resists corrosion. The magnetic base has a rubberised coating to prevent scratching, the whip can be unscrewed away from the base and has an Allen key joint to remove the whip from its holder. The cable is pre fitted with a bnc connector. ANTENNA COMPLETE IN BLACK WITH A BNC PLUG. Frequency : Covers VHF marine frequencies 144 - 158 MHZ. Connector BNC. UP TO 174 MHZ. THIS IS A BODY MOUNT ANTENNA MANUFACTURER TO A HIGH QUALITY. THE ANTENNA WHIP IS REMOVED BY UNSCREWING THE UNIT FROM ANY OF THE ALLEN KEY POINTS. VHF ANTENNA WHIP AND HINGE. Frequency : Covers VHF marine frequencies 144 - 179 MHZ. Hinged adapter: Allows changes to preferred whip angle of whip. The antenna is designed for those that wish to replace and re use their original cabling or replace a missing whip. Waterproof Car Marine Radio Antenna Rubber Flexible Mast Radio FM/AM Antenna for Boat Car ATV UTV (White). Car Marine Rubber Radio FM AM Antenna. Marine Rubber Radio Antenna. Great reception for AM/FM. FREQUENCY 824-960 MHZ. ATTACK 1 "X 14. IN THIS MANUAL ARE EXPLAINED, WITH SIMPLE AND EASY-TO-UNDERSTAND LANGUAGE, ALL THE TECHNIQUES TO MOVE SMOOTHLY INTO UNKNOWN TERRITORIES, WHETHER IT'S A WALK IN THE HILLS BEHIND THE HOUSE OR AN EXPLORATION IN THE TROPICAL JUNGLE. Antenna SIRIO SKB109 - 960ML 5 m cable fme 108/960 MHz adjustable Type: 1/4 λ Radiation: Omnidirectionnelle frequency: 108 … 960 MHz adjustable systems: 2 m - HAM, 1.25 m - HAM. 70cm - HAM, Airband VHF, VHF Marine Band VHF Low band (66-88 MHz), ORBCOMM M2M, AIS - 162 MHz, TETRA-350, TETRA, CDMA-450, LTE - 450, GSM - R, GSM-900, ISM - 169 MHz, ISM - 868 MHz ISM - 915 MHz Gain: 0 dB REF. 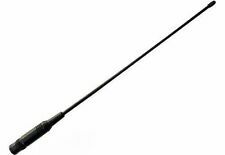 a λ / 4 whip power Max: 108-550 MHz: 100W (CW) 550-960 MHz: 30W (CW) Cable 3 m ( 9.84 ft) / RG58 connector: FME-female materials: chromed brass, stainless steel 17/7 PH, Nylon Dimension) approx): 700 mm / 2.3 ft (approx.) weight: 280 gr / 0.62 lbs. The Marine 300 is a very light, complete weather and water proof marine antenna. Its is of a high quality fibreglass and can handle all vibrations and wind speeds without problem. Great antenna - Great Value !